Check out this article in the Mail Tribune from writer Chris Conrad. Director Randy Granstrom admits "First Men on Planet 9" is his most political film to date, a piece of cinematic mayhem he describes as a post-colonial critique of Manifest Destiny in which he takes Western culture to task for exploiting native cultures and the environment in its push to dominate the New World. All he has to do now is get the damn firecrackers to blow up the miniature spaceship so he can wrap the opening scene. Granstrom and his small but dedicated crew are at work Wednesday night inside Land Mind Productions, a studio on South Fir Street, toiling amidst thick smoke and strobe lights to bring the right amount of realism to the crash landing that kicks off their film. 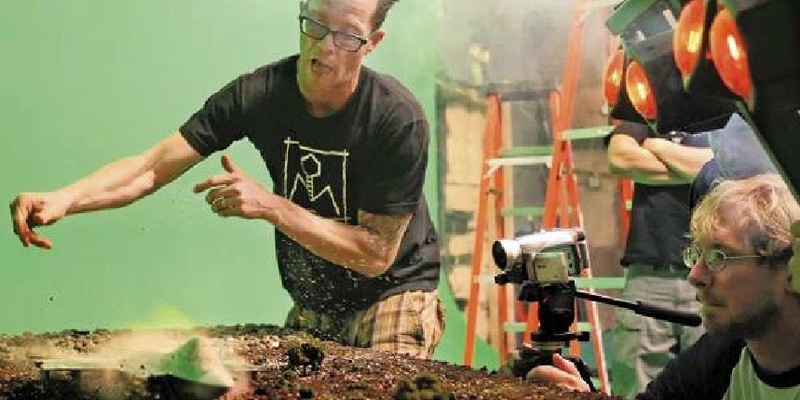 The scene involves a spaceship smashing into a miniaturized landscape — built with Granstrom's last bit of potting soil, tiny plastic trees and plaster cloth — and erupting into flame. John Foote, executive producer and owner of Land Mind Productions, fastens fishing line to the top of the ship and dangles it over the crash zone. The crew busts up when they see the fishing line stand out on the initial takes. "In my grand vision I had this awesome spaceship flying in — but no," Granstrom says. "If you saw the last Bruce Campbell movie, you saw more fishing line than in 'Deadliest Catch,' " he says. The Magnum 800 fog machine floods the set, as does smoke from Granstrom's leftover fireworks. Explosions. The original plan was to tape a road flare to the end of the ship to simulate rockets, but logistics proved daunting. The ship nosedives onto the set and plows a trench past a plastic tree, which catches fire after the firecrackers do their job. "Don't destroy the trees," Granstrom says. "I paid $8.99 for those." Camera operator and "Planet 9" actor Levi Anderson, moving from one end of the set to the other via wheelchair, captures the chaos on a small digital camera. Afterward, the crew gathers around the camera to review the footage. They love it.